Bruno Ellingham's career in music features a staggering list of incredible artists. Starting out in Moles Studios, the bands and producers he worked with would be instrumental in cementing his extensive list of credits. Ahead of his mixing masterclass at dBs Music Bristol this week, we spoke to Bruno about those early days at Moles, the incredible artists he's worked with and his current ventures. You began your career at Moles Studios in Bath working with the likes of Massive Attack and New Order. Was it a surreal feeling working with such renowned artists early in your career? "I actually didn’t meet Massive Attack till 2010. Back in the Moles days I was working with Portishead, Spiritualized, Paul Oakenfold and Elbow among others, it was daunting at times, but the key is to work within your boundaries. 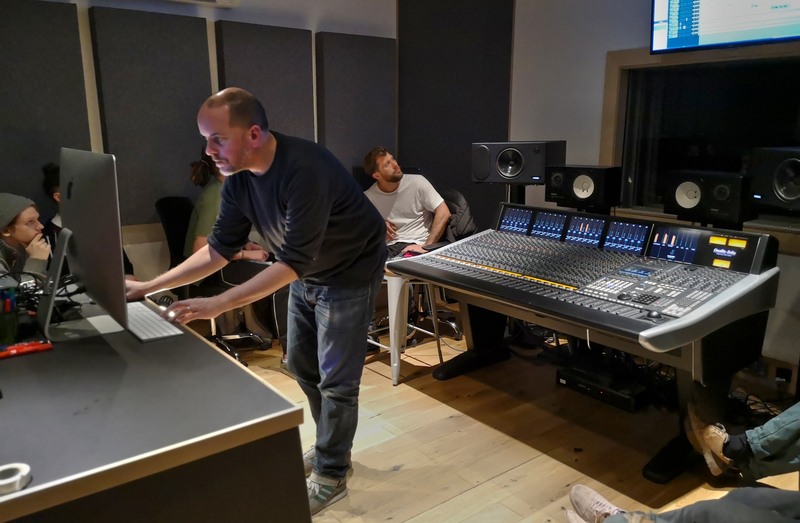 You are always learning in this job, even producers I know in their 60’s are still learning - back in 2004 I taught John Leckie how to use Pro Tools, he said it was a revelation! My time at Moles was brilliant because we worked on so many different types of music, one day it was a full rock band, the next we were mixing house music or recording for a film soundtrack, it was initially all on 2” tape, so a very different workflow from how things are today." How much of your career do you owe to those early years at Moles Studios? "During my time at Moles I worked a lot with the producer Steve Osborne. Once I felt it was time to go freelance Steve offered me a couple of jobs, I spent the next 4 years as his engineer and programmer. These were the years of New Order, Doves, KT Tunstall, Starsailor, Natalie Imbruglia to name just a few. Without my time at Moles that would probably not have happened." Your love of SSL is well documented. Are you excited to get your hands on our SSL Duality for your forthcoming mixing masterclass? Any advice for our students when using the Duality and working with it? "You’re right, I love SSL consoles, I mixed for years on E and G consoles and they just feel like home to me. The Duality is a great modern desk, a perfect compliment to modern DAWs and current ways of working. My advice is to push it as far as you can and see what it gives you, there is no right or wrong if you’re enjoying the sound of something." When you were last at dBs Music you mentioned the importance of dedicating a day to easing the artist into the recording headspace, could you give our readers an overview of this method? "Arriving at the studio to record is always an exciting day, but the reality is that for a session to go well there is a lot of setup that needs to be done, trying out drum sounds, moving amps, trying different mics etc. "It’s easy for a band to get frustrated and want to get on with playing and recording, but if the setup isn’t right everyone will end up disappointed by the results, and they’ll quite rightly blame the engineer. "I always tell bands that there is no recording on day one, that takes the pressure off so I can really explore what I can get out of the studio, usually by around 5pm everything is ready and I’ll get the band in to sort out headphone mixes. After a break for dinner I normally suggest we go back in and just slam through the tracks to get a feel for playing in the studio. More often than not we’ll end up with one or two recordings that’ll end up on the record from this session." You’re a part owner of Bath-based record label Funnel Music. What was it that attracted you to them? "The music industry has a terrible habit of being behind the curve, they really didn’t think streaming would catch on! I’ve seen many bands have a huge amount of money thrown at them only to be dropped before a record is ever released. Apart from the fact that that's a crap business model it always upset me that the members of the band were seen as collateral rather than people. "You can dream all the way through your youth about the idea of getting signed and being a touring artist, but if the wrong label sign you, spend a load of money trying to turn you into something they think is going to sell just because it worked last time and mess it up, they'll probably end up dropping you as you’re now too in debt to make a return. They could have taken 2 or 3 years of your career and then just chucked you back out on the street with no care as to what happens next. "Funnel are an artist centred label who aim to develop bands without putting them in huge amounts of debt, they introduce projects to industry professionals in all areas of the business and build a team around a project who all have a vested interest in the artist being successful. For me that's a no-brainer." We mentioned your love of SSL, but what are your must-have tools? "Pro Tools, UAD Processing, Apogee interfaces, some great mics and some great mic amps, and perhaps a talented artist with good songs!" What has been your proudest project so far and why? "That's a really tough one. Working with New Order was huge for me, I listened to Substance 87 on repeat all the way through my GCSE’s, to find myself 14 years later asking them to ‘maybe do another take, I think it could be better’ was pretty mind-blowing." What advice would you give to our students who aspire to work in music production? What are the best routes in now, how have things changed since you started? "Pretty much everything has changed now. I was lucky, I worked as a tape op and learnt everything from visiting producers and engineers. The route in is very much dependent on the genre of music you are into. "There are still great recording studios which will take on interns and train them to be assistants, then they can work up to become full engineers. Being an engineer is a great job and not just a stepping stone to being a producer. "If production is where you want to be, find a band you love and get on with it, be creative, push the boundaries and always listen to feedback. Music is so subjective and everyone hears things in different ways, if someone doesn’t like what you’ve done get them to explain in detail; constructive criticism is the best way to learn and develop." Where can people find out more about you and the projects you’ve worked on? What’s next for you? What are you working on? "My Discogs page is pretty comprehensive with regards to what I’ve worked on, as for future projects I currently mixing a record for a Mexican Actress called Daniela Mandoki, finishing an album for a new band called ‘Pale Blue Eyes’, producing Bath band ‘All That Glitters’ and working with a couple of new artists signed to Funnel…"